BRISTOL - Coming up just short of a win is never easy to swallow. 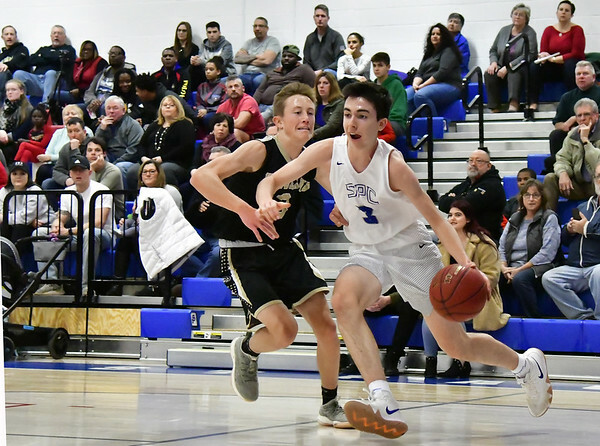 Coming a mere six inches short of a state tournament berth is another animal, one that the St. Paul boys basketball team came face-to-face with on Friday night. With a 55-53 loss to Wolcott, St. Paul remained with seven wins heading into this week, still needing one more victory to qualify for states. Now riding a two-game losing streak, the Falcons get their next chance tonight at home against Watertown. Even after Friday night’s heartbreak, there was no doubt creeping into the minds of the Falcons. The Falcons’ confidence is warranted, especially with their roster back to full strength. Senior Tyler Garry, who missed the first 12 games of the season, is back to logging full minutes and contributed nine points in Friday night’s loss. Junior guard Rudy Otero is also back after missing the first month of the season, and the final four games of the regular season should provide plenty of time for the two to shake away any rust prior to the tournament, assuming St. Paul wins one of the four games. Garry and Otero’s returns have also been a welcome sight for their teammates. Even with Otero and Garry out of sweats and back on the floor, the Falcons haven’t secured anything just yet. Watertown owns just one win so far this season, but should St. Paul slip up, things could get very interesting. Yet even if the Falcons did miss tonight’s chance, there would still be three games left, which is plenty to keep the them confident in their chances of taking the floor when the state tournament begins. Posted in The Bristol Press, St. Paul on Monday, 4 February 2019 21:43. Updated: Monday, 4 February 2019 21:45.